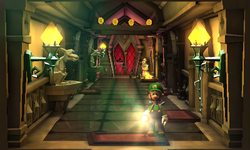 The East Corridor is a room in Treacherous Mansion in Luigi's Mansion: Dark Moon. Located on the second floor on the east side of the mansion, it contains entrances to the Nautical Exhibit, Study and Inner Courtyard, as well as a Trapdoor where the door to the Train Exhibit would be. The room itself has fairly few notable features. There are a few Gargoyles littered around that can be blasted with the Strobulb for coins, some money on the rafters and a window that looks out onto the Terrace, with not much else to be found. In A Train to Catch, Luigi explores the East Corridor to reach the Study and Nautical Exhibit. There are also a few Creepers and a Greenie that attack here when Luigi tries to use the Trapdoor to enter the Train Exhibit. The room never gets lit otherwise. In Paranormal Chaos, the East Corridor is mostly empty and used merely as a route to the Nautical Exhibit. However, if Luigi tries to look through the window to the north, an earthquake occurs and he jumps back instead. In Terrifying Invasion, the East Corridor is one of the rooms that may be infested with ghosts. Two Mummies always appear here, despite them normally never appearing in this sort of area in the main game.